Or get the Halloween Deck or Book separately. Back of card: Orange (of course), with black cats, spiders, bats, skulls, etc. Can be inverted. Book included: Yes, 137 pages, 4.65 x 7 inches, 118 x 178 millimeters, by Karin Lee. Illustrated by Kipling West. A fun, sometimes serious, companion to the Halloween Tarot. Interesting notes on the origin of Halloween in front. Publisher: U.S. Games. Cards printed in Belgium, book printed in Canada. Comments: Delightfully playful cards, inspired by the Rider Waite deck. The suits are Pumpkins (pentacles), Ghosts (cups), Bats (swords) & Imps (wands). There are vague references to the Adams Family & the Munsters, but mercifully none to Casper the Friendly. Though based on Waite, some of the cards seem an actual improvement. The Nine of Bats (swords) for example: A woman sits up in bed, plagued by nine bats. Well, of course. You'd find nine bats annoying, too. Among other cards, the Lovers shows Dracula come to call on a lady in her bedchamber, the Emperor is Frankenstein, the Hierophant is the Mummy, a pumpkin drives a hearse for a Chariot, the Hermit (Uncle Fester?) is a mad scientist in his lab, a rather panic-stricken man is staked out on the Wheel of Fortune, the scales of Justice weigh souls with rats, the Hanged Man is a scarecrow, Wolfman rips his shirt off on the Moon, Dracula makes pale victims rise from the dead on Judgment. Among the suits, Ghosts are delightfully chummy. A contented ghoul sits with Nine Ghosts behind him. A wandering traveler ignores Eight Ghosts who are caught up in their own affairs anyway. Skies tend to be midnight black. 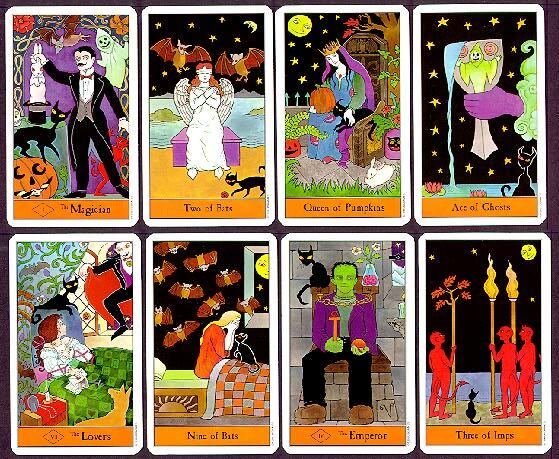 Cards feature lots of black cats, skeletons, skulls, pumpkins, smiling orbs & moons & lots of yellow stars. Don't wait for Halloween to get this enjoyable deck.